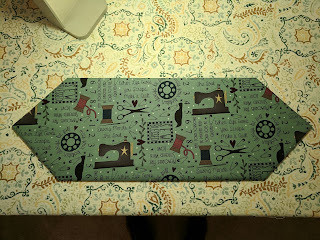 This is a smaller version of the 10 minute table runner called Skinny Minnie Table Runner. 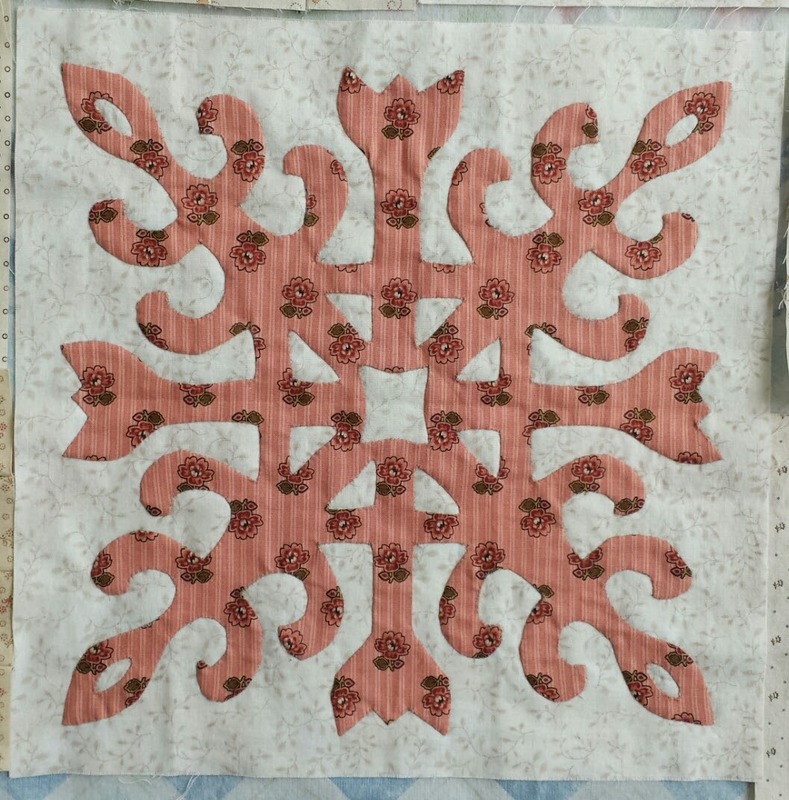 I bought this kit at Cinnamon's Quilt Shoppe in Jacksonville FL on our way to Florida. It went together so quickly. 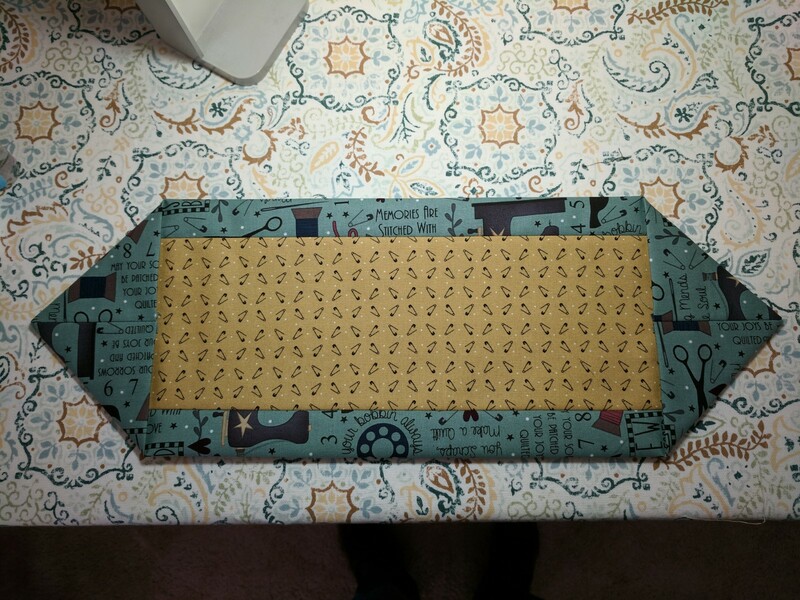 It took about a half hour to sew it up. There is no batting. You could piece some blocks into a row and finish it the same way. You can also embellish it as you like. I have 1 button at each end on the flap. 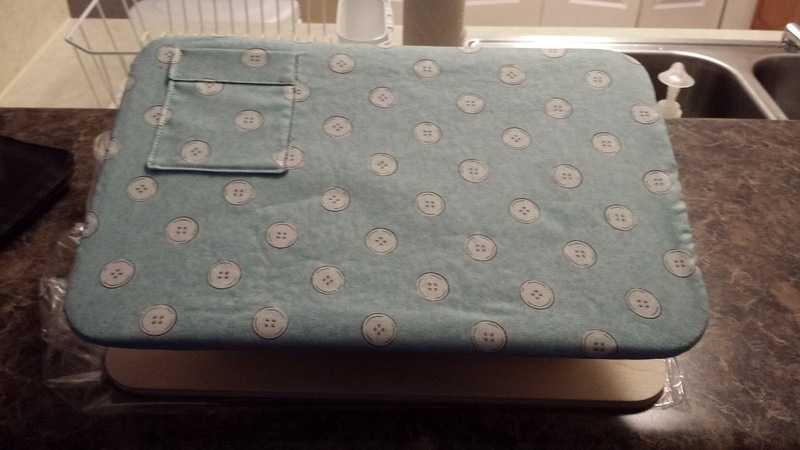 It came with fabric to make yo yo's and the buttons, but I decided just to use the buttons. Here is a link to a you tube video that shows how to make it. Today is show & tell day for the Christmas Caroling Row A Long. 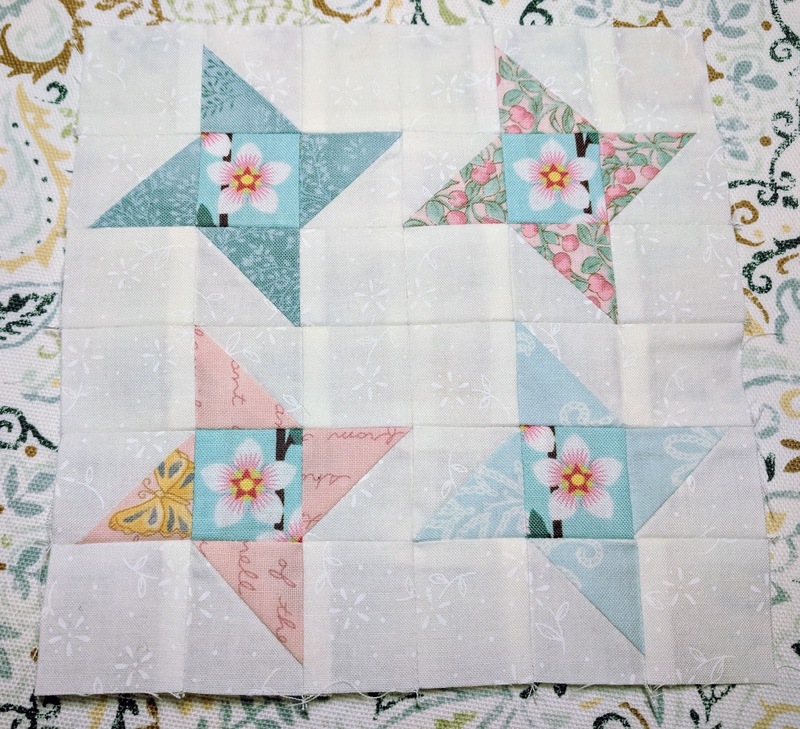 A number of the participating designers used some of the rows that you have seen and put them together in clever ways to share even more inspiring projects for you! 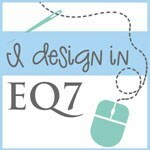 Please check them out and enjoy! 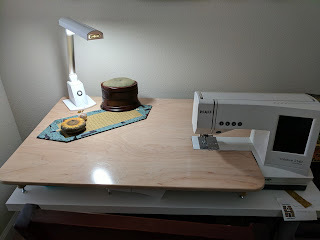 Congratulations to Jayne P. and Mary Lou B. on winning an Inspired LED Sewing Machine Light during the Christmas Caroling Row Along at Seams to Be Sew with your comments left at Happy Sewing Room (that's me :-))! 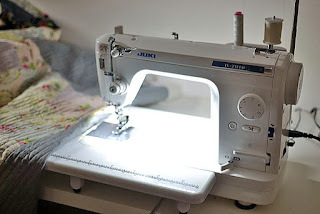 You should have received an email from Marian from Seams to Be Sew with details of receiving your prize. I hope that you enjoy them! Thank you so much for hopping! Three more blocks done for Grandma's Kitchen! Block 9 The Kitchen Window, Block 10 Recipe Box and Block 11 Peppermint Swirls. The kitchen window looked out into the backyard and the side yard. 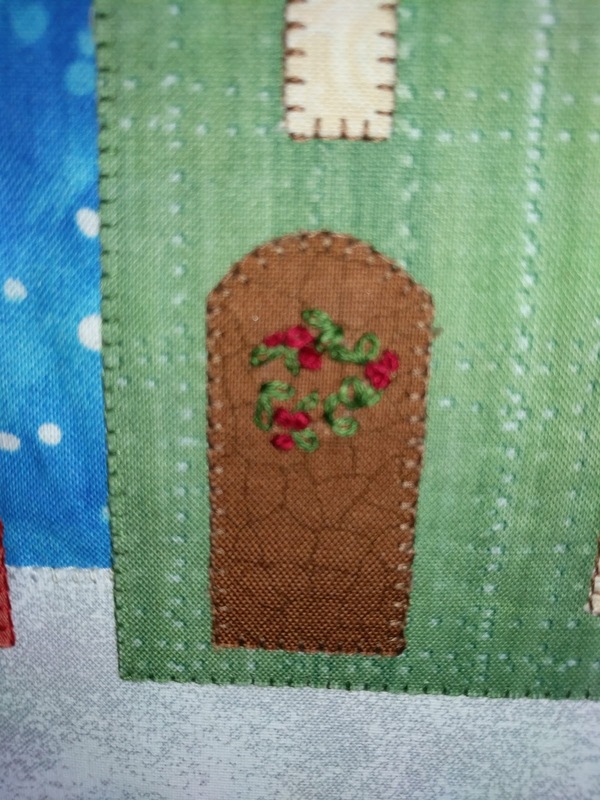 There were always flowers around, so I used a floral fabric for the windows. I don't remember my Grandma having a recipe box, but my Mom did. 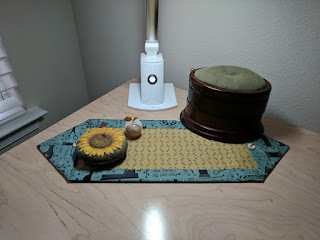 The recipe box was floral with stripes, but in blues and yellows. The light floral print is blue flowers, although the rest is not. I remember my Great Grandma having a candy dish, which was a glass chicken sitting on the nest. I loved that thing! However, I do not remember what candy was in it! :-) I made my candy into flowers since I know that my Great Grandma, Grandma and Mom loved flowers. I did use one of my Mom's old buttons for the center of one of the flowers. 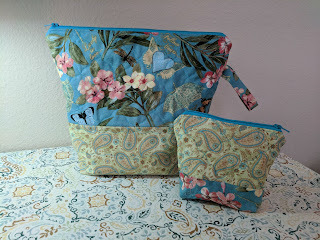 I just finished making a project bag and a matching small pouch. 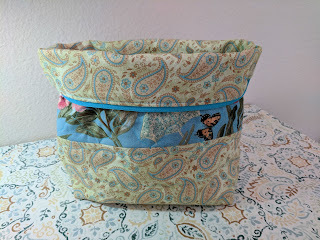 I saw on many knitting podcasts that they used these project bags for their knitting. 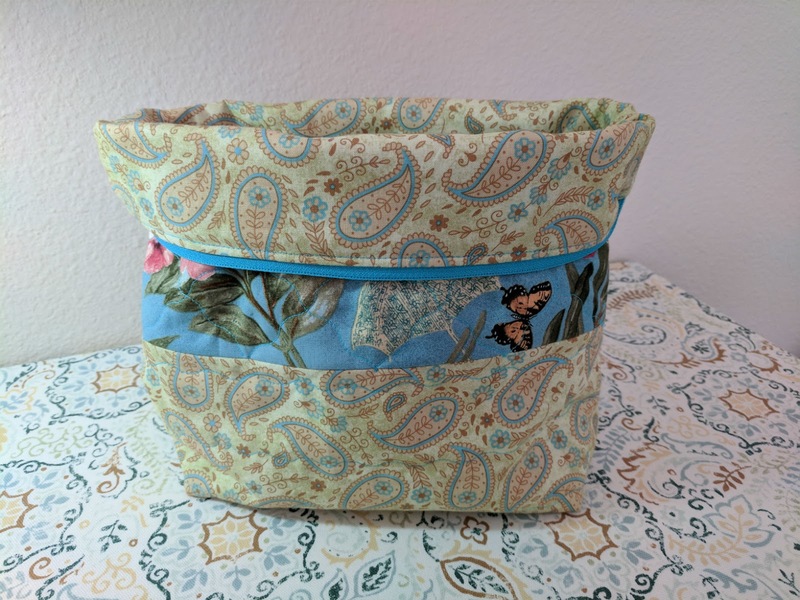 I really liked them and thought that they would be good for both knitting and sewing or whatever you can think of to use them for. 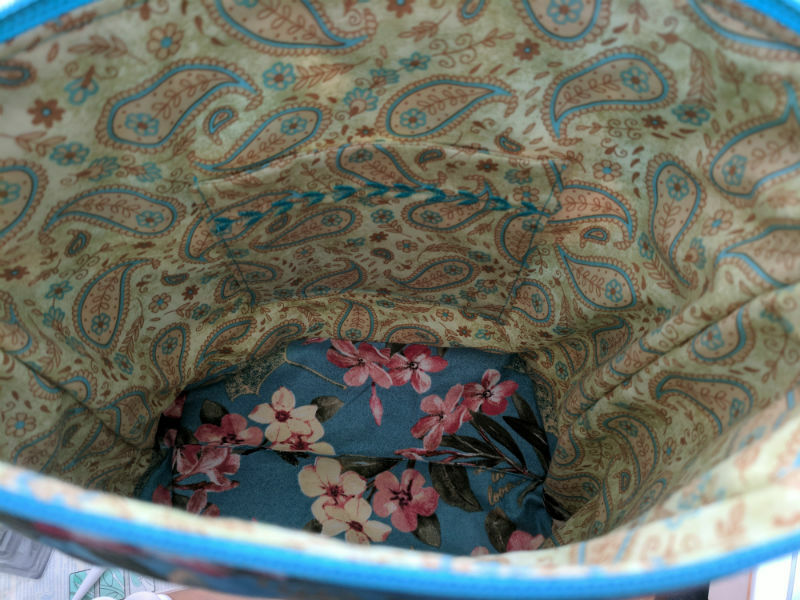 I like that you can fold it down, since it is a soft bag, and it makes it like a bucket and easier to have your yarn accessible to knit with. 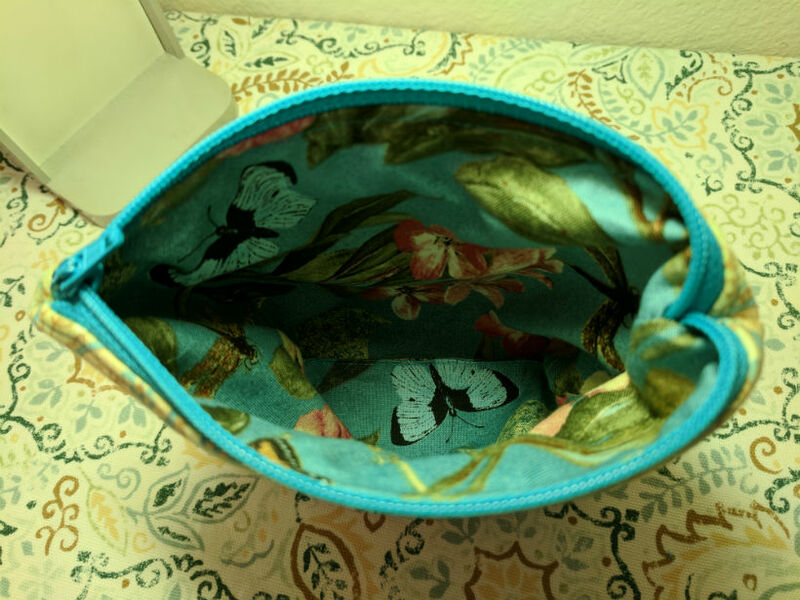 I added a pocket to my lining in the large bag and decided to fully line the smaller pouch, with no raw seams exposed. 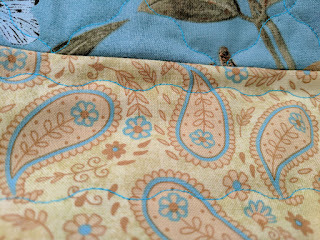 (Yes, sometimes I get a little crazy 😁) I didn't quite have enough fabric for the lining, so I added a little bit of the contrast fabric to make it work. I quilted both bags using the serpentine stitch and did part grid and part straight lines on the larger bag and a full grid on the smaller pouch. 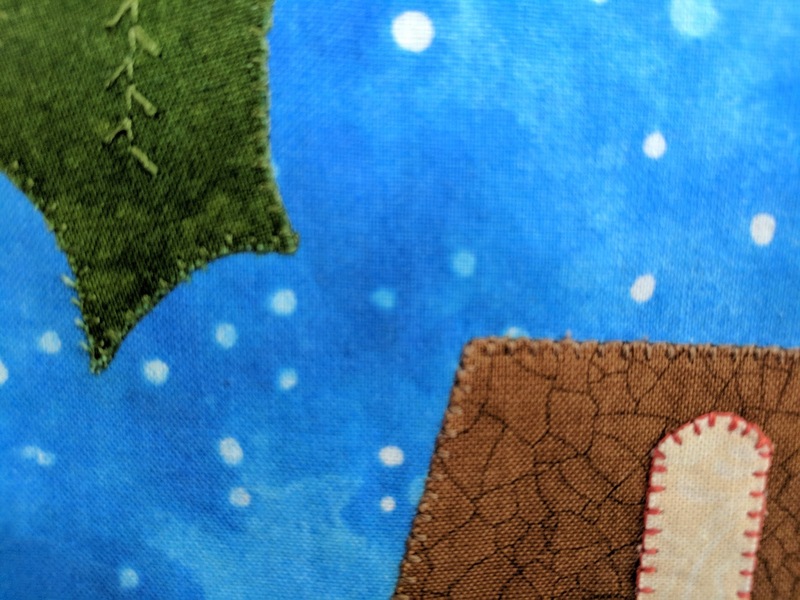 I like the look of this stitch, versus a straight stitch, since it adds some softness to the look. 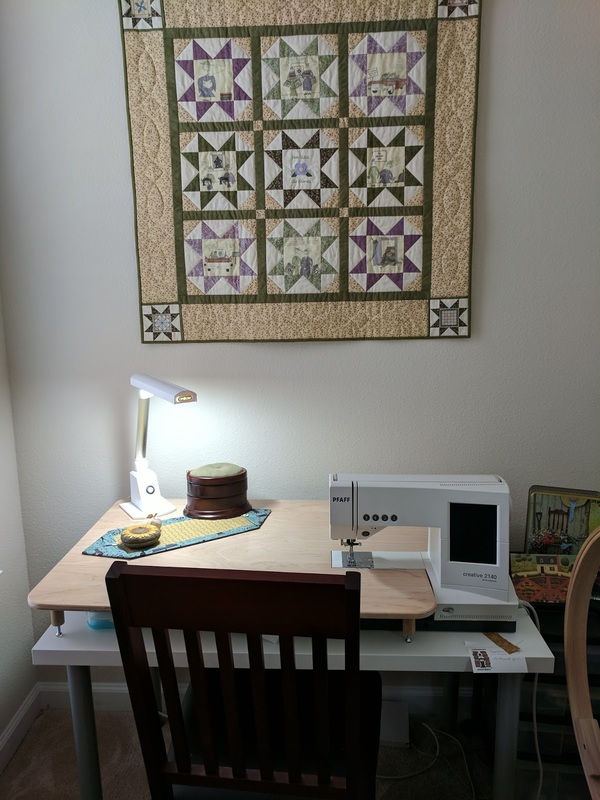 I did a few modifications to it for my use, but the basic technique is hers. I think I may be making more of these in the future. 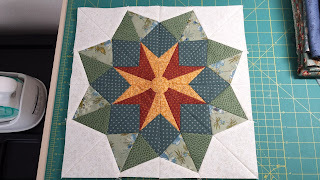 I hope that you are having a great time doing the Christmas Caroling Row Along Blog Hop! 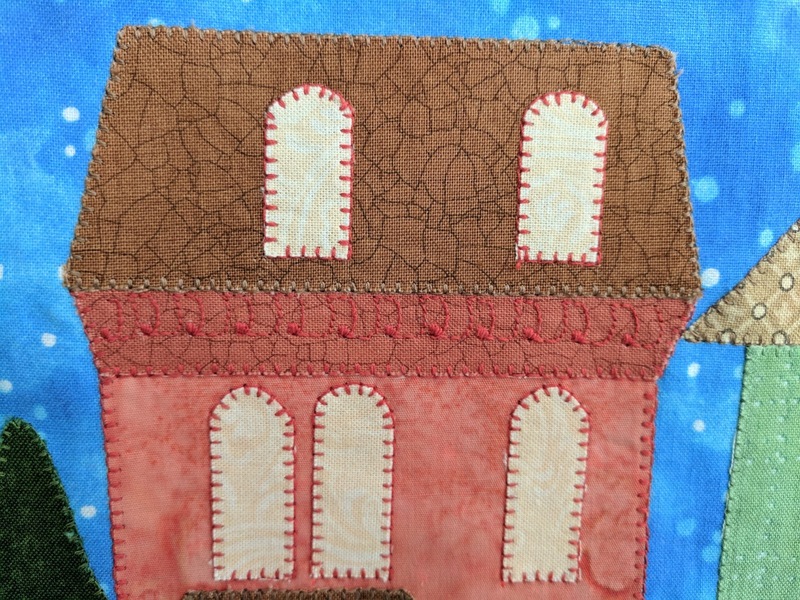 Thank you Marian Pena of Seams to be Sew for hosting the hop and for all the work that you have done! 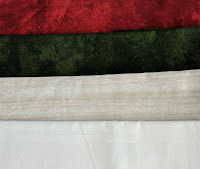 Thank you also to Northcott Fabrics for the lovely fabric that you have donated to us to use in our rows. I chose the Christmas Carol "God Rest Ye Merry Gentlemen" for my row. I really loved the chorus - "O Tidings of Comfort and Joy". In doing research for the Christmas Carol, I found this fifth verse from 1775 which I really liked. I pictured Victorian carolers gathering in town singing and spreading love to all who heard them. I usually use Electric Quilt to do my designing. 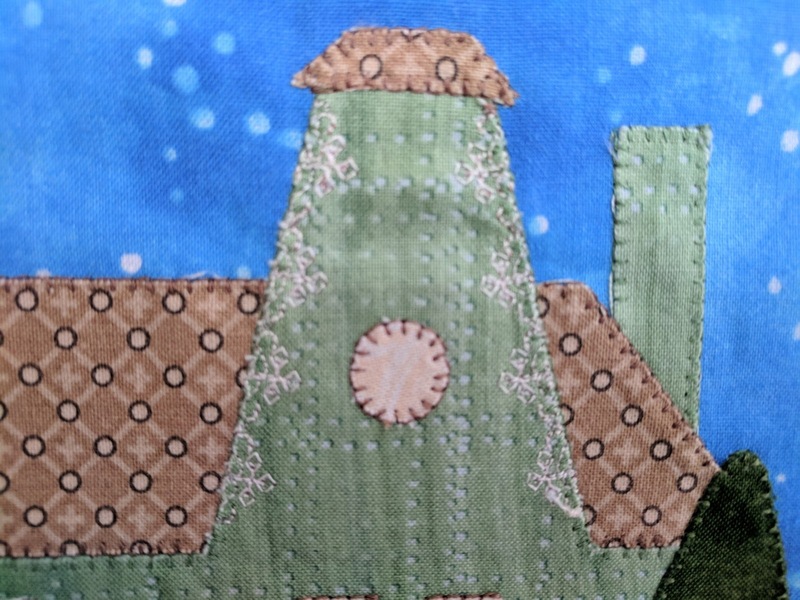 This is the first time that I created appliques using this program. It was both challenging and fun for me. I hope that you like it. I did this row using fusible applique, but you could also do it with hand applique or whatever is your favorite method. 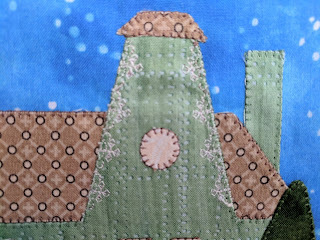 I wanted to add some architectural detail to the houses, so I used some of the decorative stitches on my sewing machine. 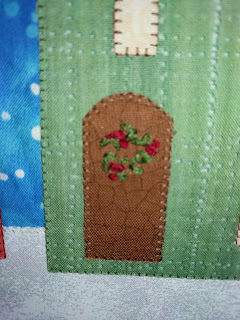 I added a feather stitch to my holly leaves and hand embroidered a wreath on one of the front doors. You can have a lot of fun just deciding exactly how you would like to finish this row. Keep it simple or go wild! 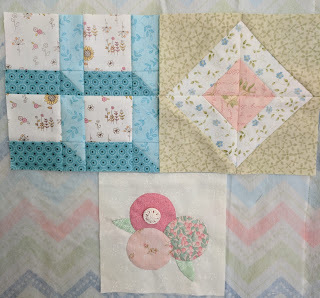 I decided that I would like to finish this row as a wall hanging and put a border on it that kind of looked like a frame, but still keeping a little Victorian feel to it. This is what I came up with. This is a real easy border to do. It just uses squares and rectangles. 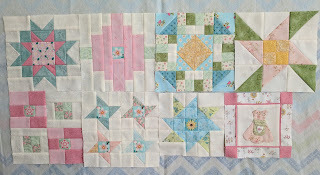 I have included this finished border instructions in my pattern. 9020-10. The wood grain looking fabric was from Hurry Up Santa 21712-11. My background was also a Northcott, but it was from last year. 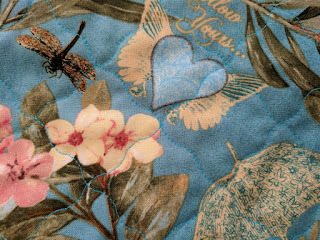 They have one with the same print, but a different blue from the Magic of Christmas 21701-44 which would work well. There are also giveaways during our Christmas Caroling Row Along! You will find additional giveaways that were generously donated by Northcott Fabrics and Calibre Art on Marian's Blog. 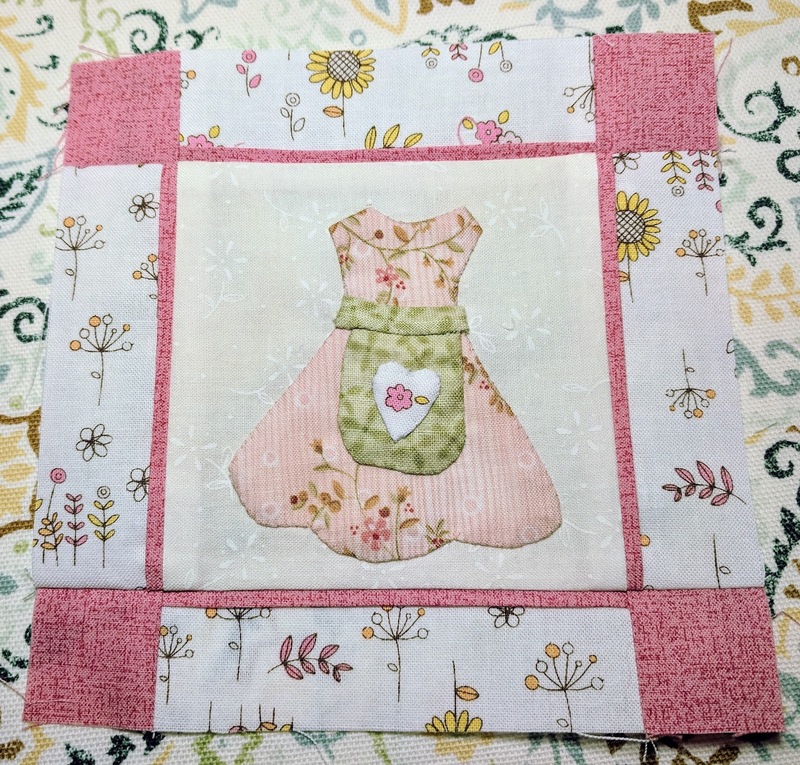 The second block is Grandma's Apron. 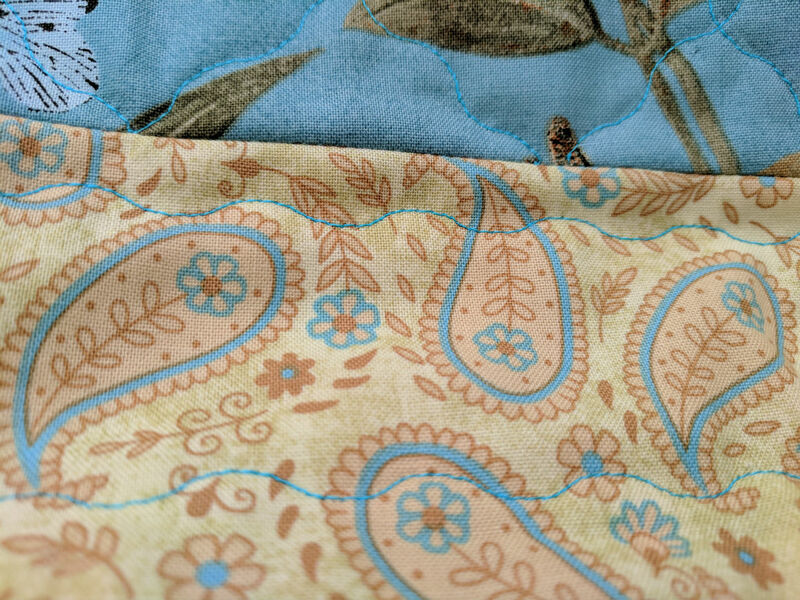 I don't really remember my Grandma or Mom wearing an apron, so I chose colors that I thought they would like. 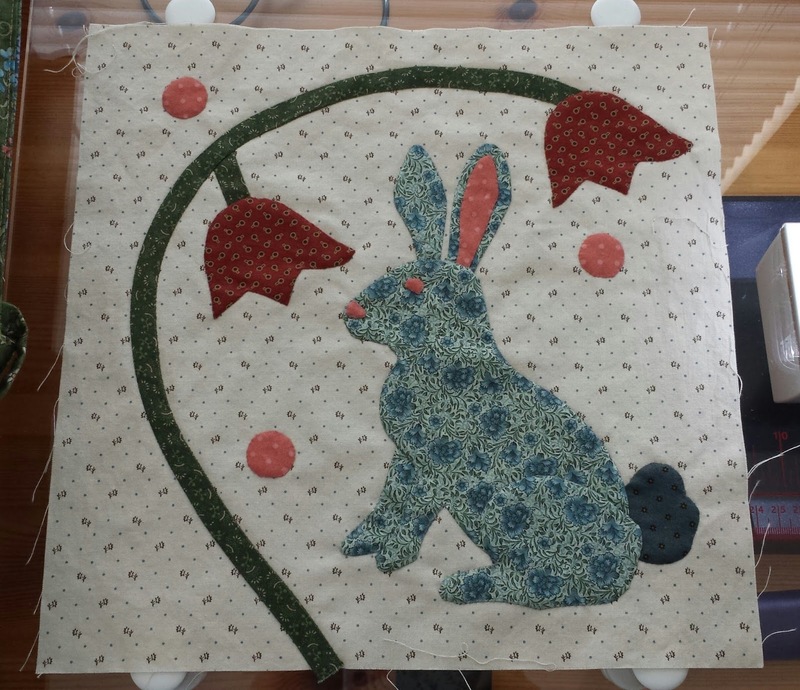 The apron was to be done as a fusible applique, but I decided to needle turn it. The heart was a little challenging since it is only a half inch in size. 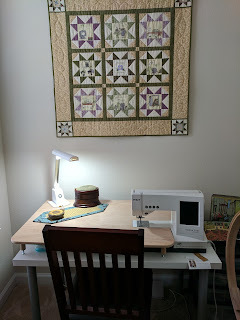 I thank Sarah Fielke for her wonderful needle turn instructions! Below is a picture of all of my blocks so far. They consist of both 5" and 6" blocks. Pat's directions are for 10" and 12" blocks, but I shrunk mine. It will be interesting to see how she puts them together when we have finished the 25 blocks that make up the Grandma's Kitchen Quilt. 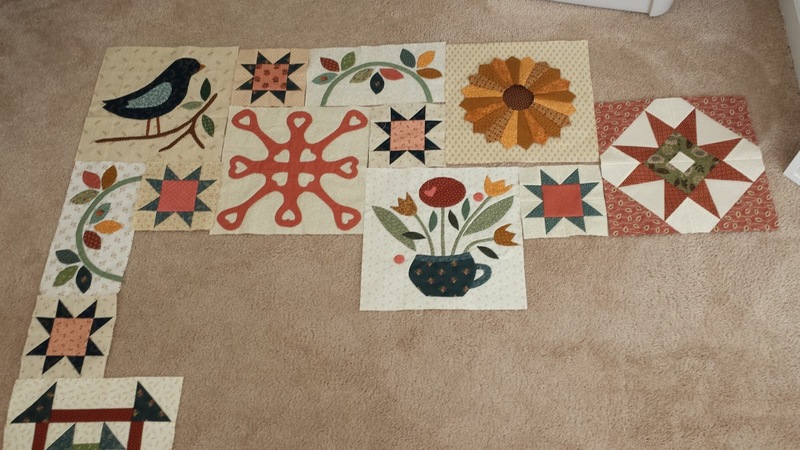 All of my blocks so far! I hope you get a chance to do spend some time with loved ones and do some things that you enjoy on this long Labor Day weekend! 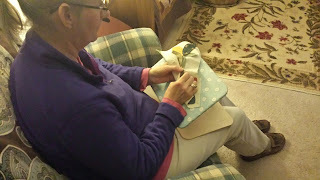 I started sewing blocks for the Pat Sloan Grandma's Kitchen Challenge. 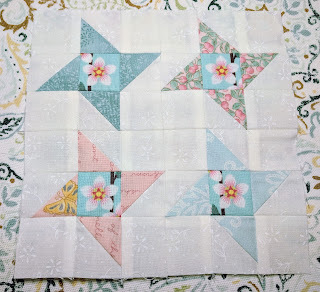 This is a block of the week. A new block comes out every Wed. There will be 25 blocks in all. Block 9 just came out. 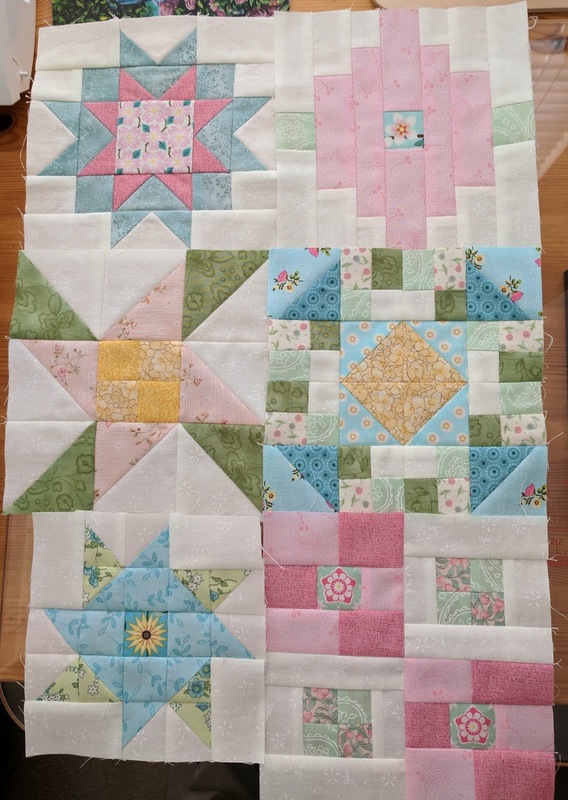 I am a little behind and have gotten 6 blocks finished so far. I am making this quilt in honor of my Mother who passed away 5 years ago. 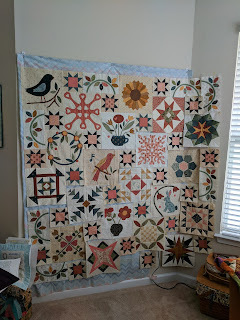 My Mother loved flowers, birds and quilting. 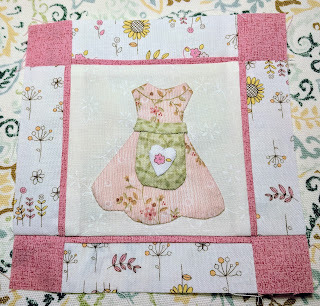 I thought I would use florals in some of her favorite colors. 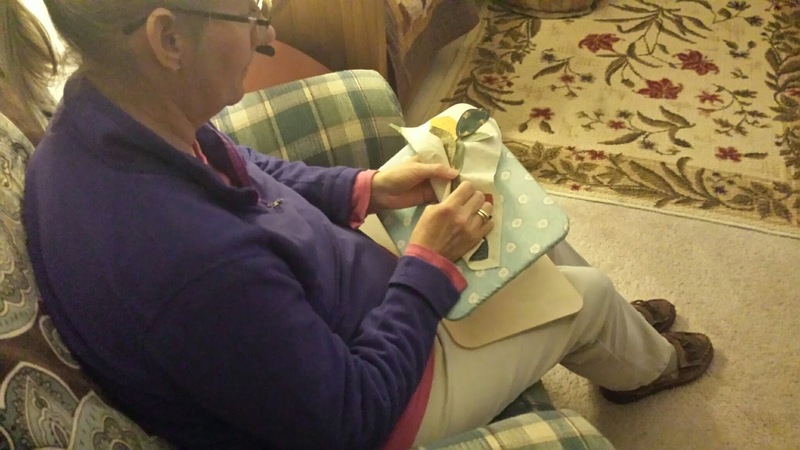 As I am sewing this, I also remember my maternal Grandmother and Great Grandmother. I spent many wonderful family gatherings at my Grandmother's house and my Great Grandmother lived next door. She had the glass chicken sitting on a nest candy dishes. I always got a treat from them. Maybe that's why I love those dishes today. Thank you Pat for this inspirational quilt along. 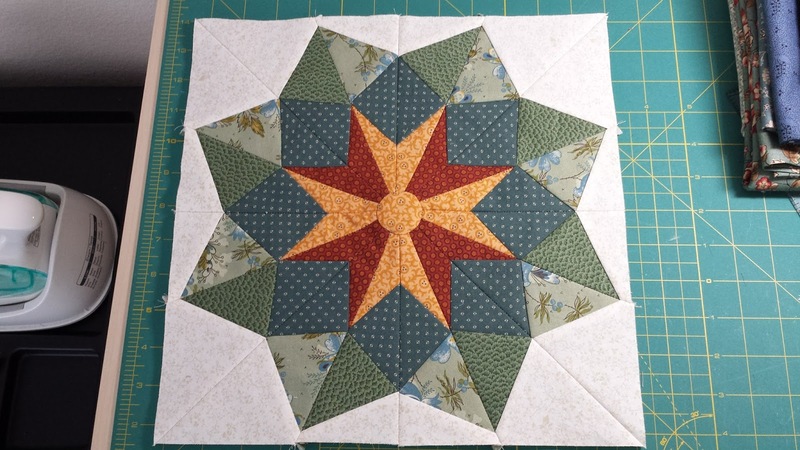 It will be a very special quilt for me. If you would like more info on this block of week, you will find it here. I am so excited to announce that I was asked to design a row for the Christmas Caroling Row Along! 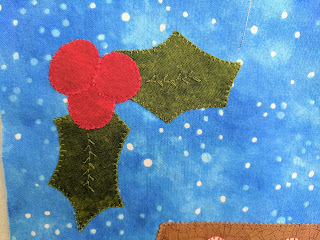 This will be a blog hop featuring different designers offering a free pattern for a row based on a Christmas Carol. My Christmas Carol is God Rest Ye Merry Gentlemen. 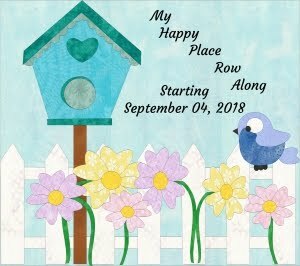 Here is a small preview of my row! 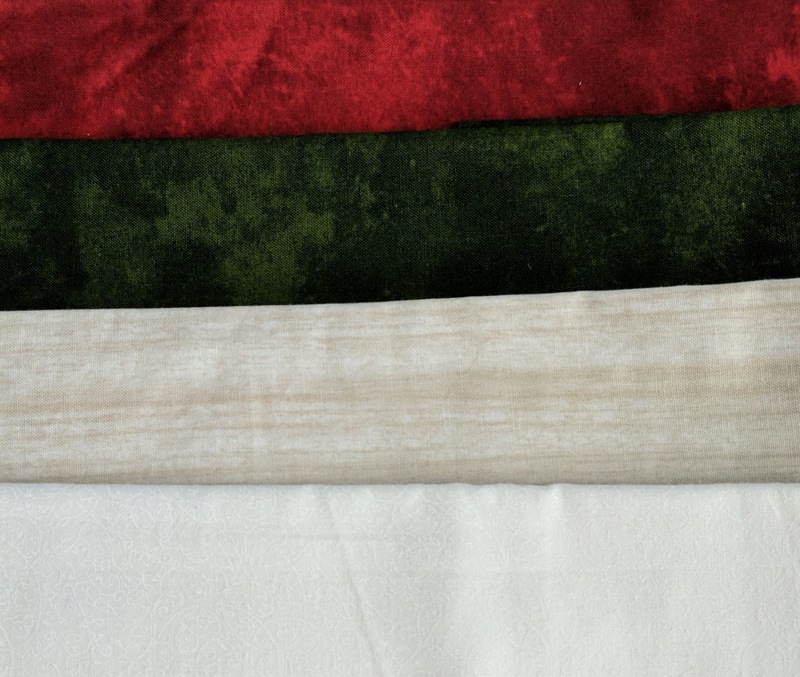 Northcott Fabrics generously donated fabric to each designer to use in their row. 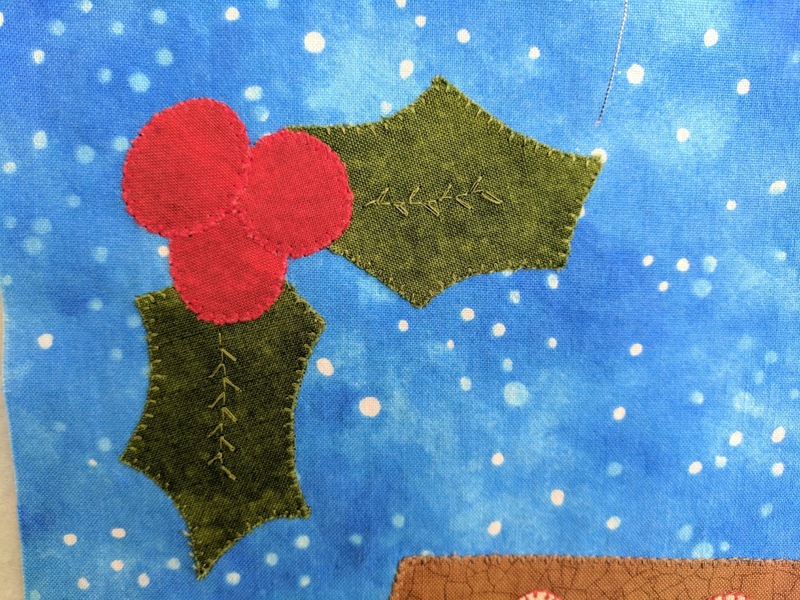 You can get more info on this blog hop by clicking on the Christmas Caroling RAL Logo on the side of my blog!